♥ How much will we receive in our shares throughout the season? 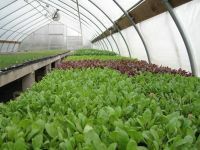 Share sizes differ each week based on availability of produce, which is dependent on a wide range of variables such as weather conditions: sun, heat/cold, rainfall; crop variety; time of year; pest or weed pressure; timeliness of planting; and so on. We strive, however, to have a minimum of 8 different kinds of vegetables or fruits each week, and a m aximum of about 16 in good weeks. These amounts average across the season to about 3/4 bushel or more--approximately one standard paper grocery bag, which typically feeds a family of two adults and two children for a week. However, our members' needs and wants are different, and what one family considers plenty, another family might think too slim. If you have a family that loves vegetables and you have the time to prepare several meals weekly, then purchase a full share. If you're an individual or couple and tend to eat out a lot, an every-other-week share will probably be adequate. If you have a large family or you like to juice your fruits and vegetables, consider getting two shares. An example of an early season box (June) contained lettuce, peashoots, strawberries, hakurei turnips, mustard greens, spinach, arugula, pac choi, garlic scapes, and rhubarb. An example of a mid-season box (August) contained lettuce, tomatoes, melons, peppers, potatoes, chard, beets, summer squash, cucumbers, garlic, green beans, onions, parsley. A late-season box (October) contained lettuce, leeks, potatoes, chard, carrots, turnips, chinese cabbage, garlic, broccoli or cauliflower, and pie pumpkins. ♥ Can I get extras of my favorite things, or larger quantities for preserving? We sell extra vegetables, fruits, and selected locally-produced food products (honey, oil, maple syrup, cheese, etc.) through our online Farm Store at FarmMatch, for delivery with your weekly box. CSA members will receive weekly email reminders about store hours. From time-to-time throughout the season, we also offer opportunities to come to the farm and pick your own berries or other produce, as well as group cooking events. Past events have included "Pesto Festo" and "Jam Sessions". ♥ Do you grow all the vegetables and fruits we receive in our shares, and is everything organic? We grow the vast majority of items you receive in your shares each week. Some produce, such as corn and potatoes, requires large amounts of land to grow or requires sophisticated or costly equipment that makes for easy or quick harvest. We usually contract the growing of our corn, and we sometimes need to buy extra potatoes to make it through the CSA season, but we always purchase these items from growers that we know and respect, and if at all possible, we make sure that we buy organic. ♥ Can we exchange items we don't want for those that we do want? This option will only be available at the Farmer's Market-style pick-ups; members picking up pre-boxed shares at other site s will not be able to exchange items. ♥ What if I'm not familiar with some of the vegetables I receive? Our weekly newsletter includes links to photographs and other information about every vegetable included in the box and features a variety of recipes and cooking suggestions. See also our Resource tab, where you will find a substantial listing of recipes from farms all over the U.S. The recipes are updated frequently, in keeping with the seasons. Every newsletter also includes a produce Storage and Handling Guide. ♥ Even though I have an Every-Other-Week Share, can I receive all of the newsletters so that I can stay abreast of news of the farm , recipes, and so on? Everyone on our mailing list receives a weekly newsletter during the CSA season. If you are an Every-Other-Week subscriber, the message subject line will tell you whether or not it is your week to pick up a box. We also have a link list of back issues of the newsletter on our website, so that you can access them anytime. ♥ What should I do if I am unable to pick up my share one week? If you are unable to pick up your share, it is imperative that you notify us at least 48 hours in advance to make special arrangements; or you may have someone else pick up your share for you. Any boxes that are not picked up during the regular time become the property of the site host. The majority of pick-up sites do not have after hours pick-up or refrigerated storage space, and we do not want to impinge upon the generosity of our site hosts by complicating their schedule. ♥ How can I become a host site? TCG welcomes new sites for our CSA and FarmMatch deliveries. All hosts receive a complimentary CSA box. Read our Host Site Guide for full details. ♥ Can I visit the farm? We are happy to show you around the farm if you make an appointment. We usually offer several events during the season, including cooking and other educational workshops as well as self-pick opportunities for selected vegetables and fruits. A Harvest Festival takes place each fall for all members and friends.